A few years ago I lost my source for period correct Trunk locks so I decided to make my own. 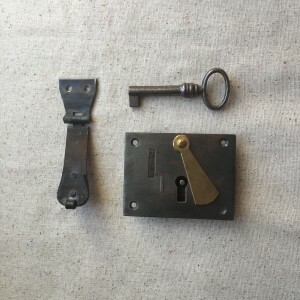 In Joseph Moxon’s Doctrine of Handy-Works, he describes “Locks for several Purposes, as Street-door Locks, called Stock-Locks ; Chamber-door Locks, called Spring-Locks ; Cupboard Locks, Chest-Locks, Trunk-Locks, Pad-Locks, &c.” For my purposes I am only interested in the Chest Lock and Trunk Lock. So what is the difference between a Chest and a Trunk. I understand the difference to be a chest is a box used to store things and and trunk is used to hold the personal effects of a traveler. This is my smallest lock which is appropriate for Trunks up to about 20″ wide. All of the parts are made from 16 gauge mild steel which is about a 1/16″ thick. 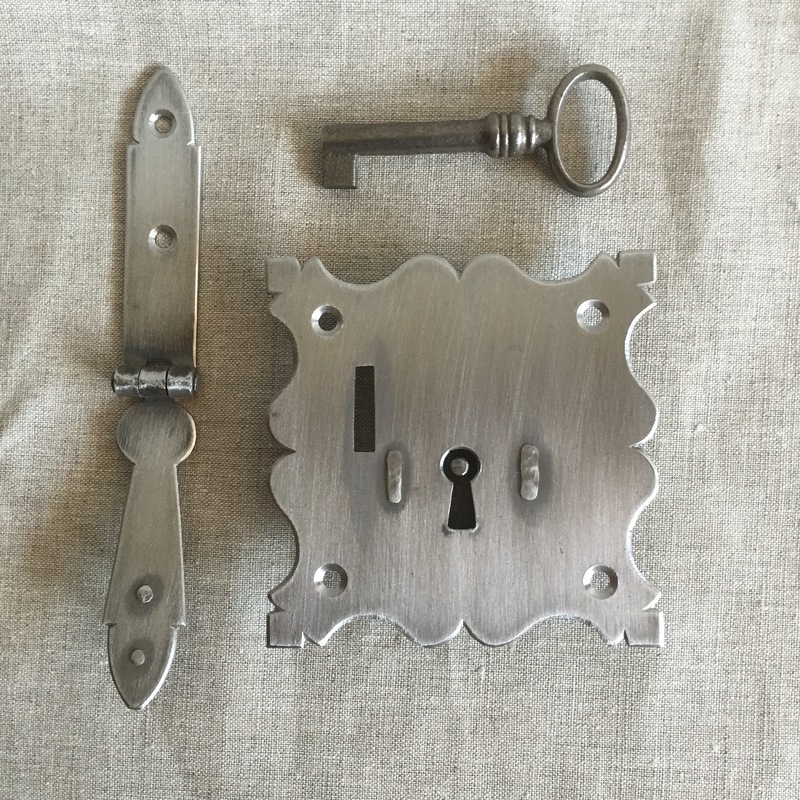 This lock comes with swinging keyhole cover in either brass or steel. 1″ nails as well as flat head screws are supplied with the lock, either may be used. Traditionally nails would be used which would be hammered through the lock and trunk and clinched over on the inside. The key is cast steel with a hollow end that pivots around the pin. 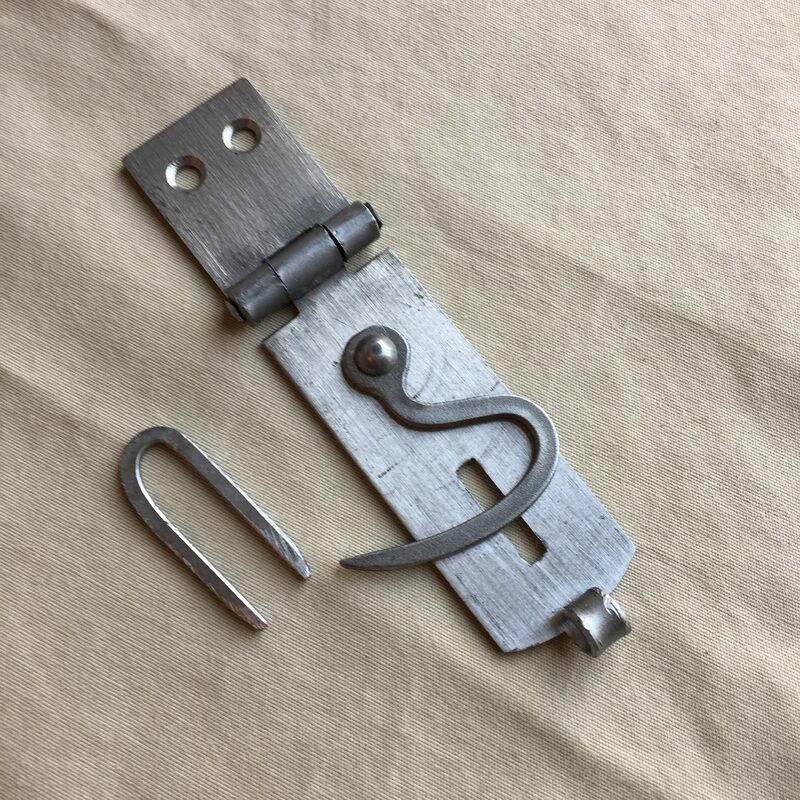 This lock is appropriate for Trunks over 20″ wide. All of the parts are made from 16 gauge mild steel which is about a 1/16′ thick. 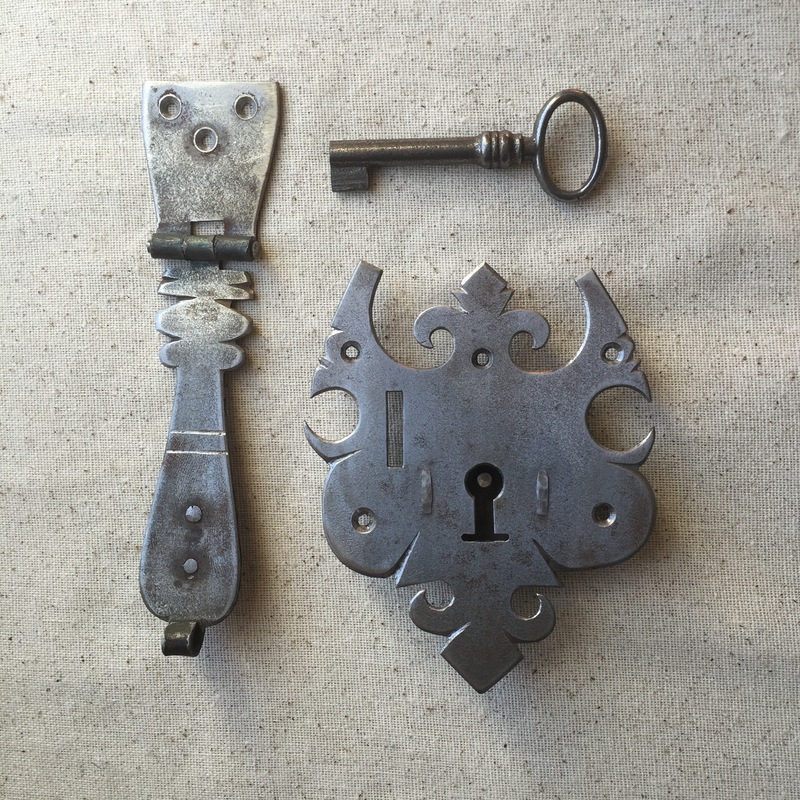 This lock comes with swinging keyhole cover in either brass or steel. 1″ nails as well as flat head screws are supplied with the lock, either may be used. Traditionally nails would be used which would be hammered through the lock and trunk and clinched over on the inside. The key is cast steel with a hollow end that pivots around the pin. This is a copy of a commonly used lock on document boxes. All of the parts are made from 16 gauge mild steel which is about a 1/16′ thick. 1″ nails as well as flat head screws are supplied with the lock, either may be used. The hasp was usually bent around the top edge of the box, either 90 degrees on a flat topped box or curved on a domed top box. 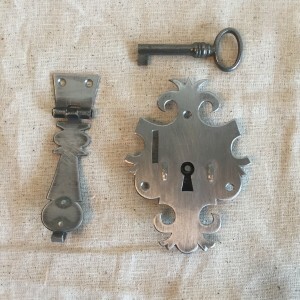 The key is cast steel with a hollow end that pivots around the pin. 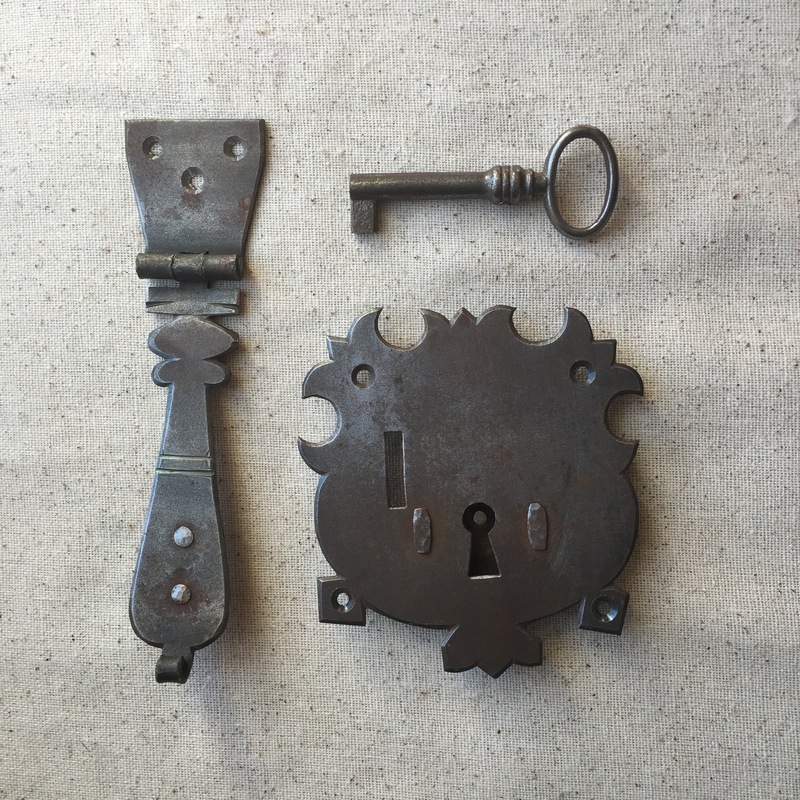 This is a copy of a lock that was on an old chest dated 1657. 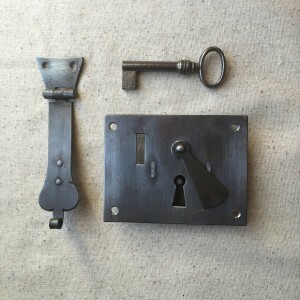 The lines of this lock along with the bevel and chamfer treatment are stunning. 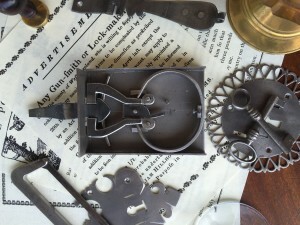 The lock is made from 16 gauge mild steel. 1″ nails as well as flat head screws are supplied with the lock, either may be used. Traditionally nails would be used which would be hammered through the lock and trunk and clinched over on the inside. 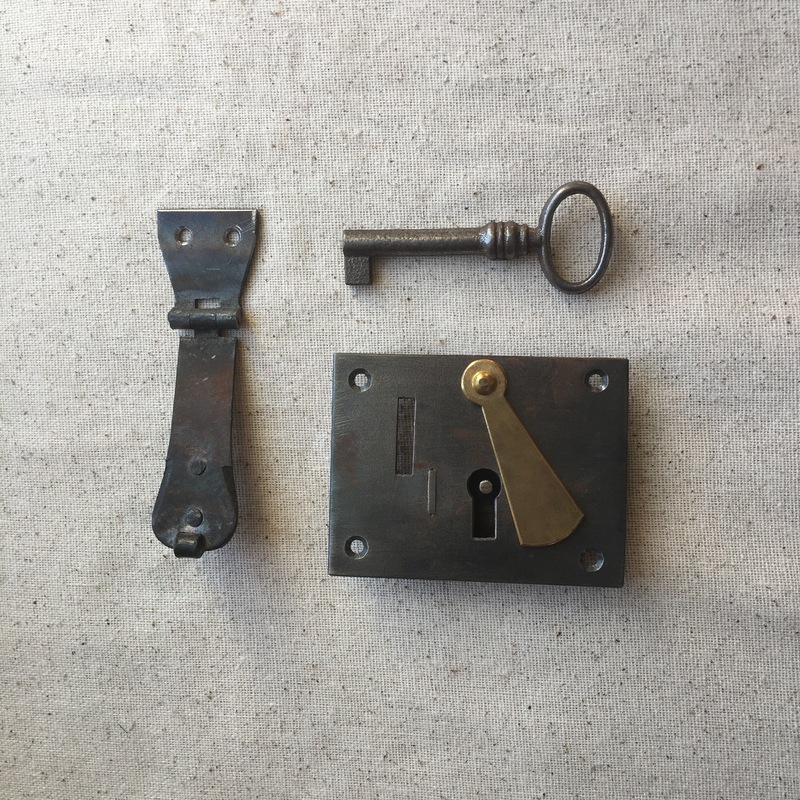 This is a copy of a lock that has nice lines and ample bevel treatment but more of a “country” look. The lock is made from 16 gauge mild steel 1″ nails as well as flat head screws are supplied with the lock, either may be used. Traditionally nails would be used which would be hammered through the lock and trunk and clinched over on the inside. This is copy of a lock from a 16th century English example. 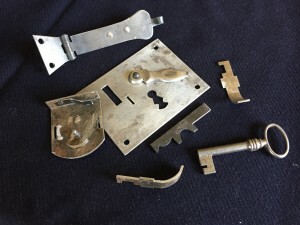 The lock is made from 16 gauge mild steel 1″ nails as well as flat head screws are supplied with the lock, either may be used. Traditionally nails would be used which would be hammered through the lock and trunk and clinched over on the inside. This is copy of a common hasp used in a variety of applications. 1″ nails as well as flat head screws are supplied with the hasp, either may be used. 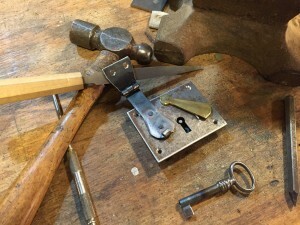 Traditionally nails would be used which would be hammered through the hasp and trunk and clinched over on the inside.